Free Shipping on orders above $110. Winner of the international SupplySide Editor’s Choice Awards, the Omega Heaven® cookie is a pure joy to eat. Each chocolate-covered cookie contains 4 grams of soluble oat fiber and 1000 mg of EPA/DHA from fresh, full-spectrum cod liver oil. Plus, it’s gluten-free! Enjoy for breakfast, dessert or as a hearty snack. 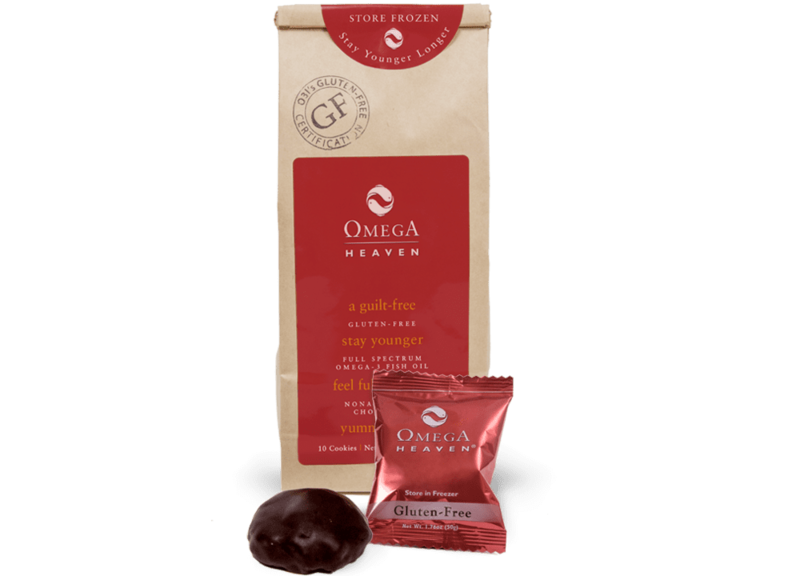 Eat one to two Omega Heaven cookies each day as a breakfast substitute, sizable snack, or dessert. Store Omega Heaven in the freezer or refrigerator as soon as you receive your bag. In the freezer, the cookies will keep for up to 4 months. Ingredients: Gluten-free oats, non-alkalized dark chocolate (cacao, cacao butter, sugar, natural vanilla flavor), orange juice, purified cod liver oil, egg whites, extra virgin olive oil, white rice flour, applesauce, honey, banana puree, calcium citrate carbonate, beta glucan oat fiber, cinnamon, baking powder, baking soda, xanthan, natural coconut flavor, vitamin D3. Omega Heaven’s power lies in its potent ingredient combination. Each cookie delivers 1000 mg of EPA/DHA omega-3, as well as four grams of oat fiber, which has cholesterol-lowering potential. Besides tasting delicious, the non-alkalized dark chocolate coating plays both a functional and nutritional role: It preserves the moisture and texture of the cookie and provides an extra antioxidant boost. It took us over seven years to develop the patented technology that would allow us to bake effective doses of fish oil into a cookie without it tasting fishy. But how did we know the omega-3 still delivered the same benefits after being baked? Lots of research. We conducted bioavailability studies, as well as collaborated with schools to measure how eating an Omega Heaven daily impacted the focus and performance of students. What Omega Heaven does not contain is just as important to us as what it does. We’ve eliminated all processed ingredients from the baking process, including trans fats, high fructose corn syrup, preservatives and color additives. People with food sensitivities can also rest assured, this is a certified gluten-free cookie.